in 3DS Max, Maya, Lightwave or any other network rendering software? 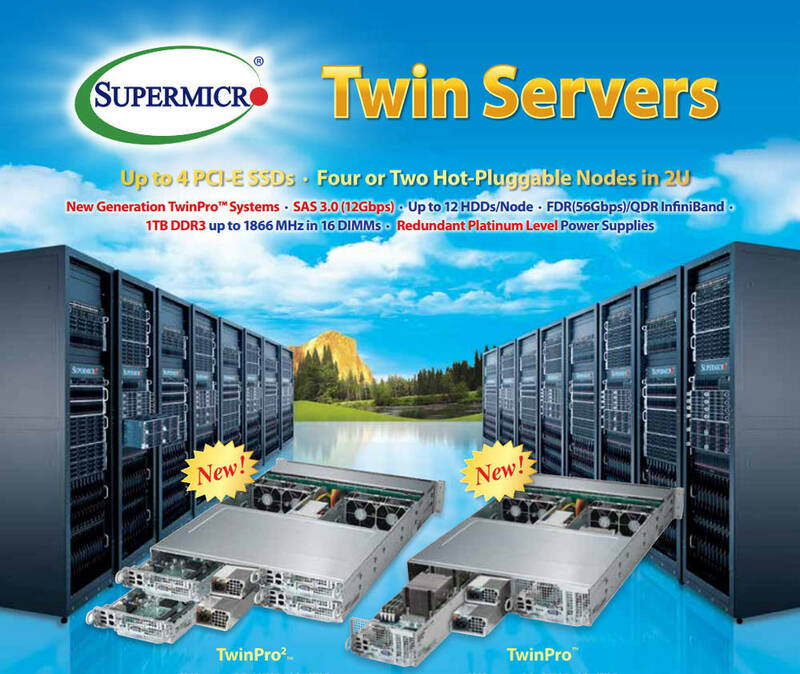 The Supermicro Twin systems provide a high density computing solution that is ideally suited for use as a one-box render farm. With configurations based on 1U, 2U and 4U these systems house 2, 4 or 8 dual Intel Xeon processors with up to 18 physical processing cores per CPU. That density will give you 288 cores (576 processing threads) in just 4U of rack space! Each Twin system comprises of a single rackmount chassis with multiple hot-swappable system nodes. Each node is a self-contained dual processor PC supporting large amounts of RAM and multiple hard drives. There are even specialist variations which allow for multi-GPU configurations for those who use GPU rendering and/or CUDA processing. By utilising a combined chassis architecture these systems reduce not only the overall physical footprint of the systems but increase both power and cooling efficiency providing long-term savings and reduced TCO. As each node is a standard dual processor PC they are easily integrated into your existing network infrastructure. Running Windows or Linux and based on enterprise class, industry standard Intel hardware these systems are easily maintained and widely supported. Simply install you network render client software and you are ready to get rendering. Each node also has a built-in IPMI (Internet Protocol Management Interface) which allows administrators to remotely monitor and control the system. Power up, power down, monitor temperatures and even take control via the built-in KVM software. If you are looking to expand your rendering capacity then contact us now for a personalised Twin quotation tailored to your requirement. Call us 01462 433558 or use the form below.